At my writing group a couple of months ago, my friend Nadine launched into a list of all the things going on in her life that keep her from writing: full-time work, single-parenting, a new-ish relationship, a long commute, and the fact that all these things leave her exhausted and without a moment to spare. And besides, writing fiction can seem so frivolous when there is all that real life stuff which needs doing! Discussion ensued, during which I made an impassioned defense of taking time for the writing craft – stories are a profound shaper of the world we live in, and at their best are the engine which moves us forward to a new perspective, attitude, or even social organization. In fact, I argued, almost everything our current civilization is based on is a story, told repeatedly, until it is “truth”. (Example: Tell me how it is that banks can lend more money than they have in reserve. The fact that there is no rational answer for that gives us a pretty strong clue that the economy as we know it is basically a fiction, tied to nothing except believe in the story we have concocted for it). Ergo, time for writing is not frivilous – it is some of the most important work we can do. Turns out, according to a new book by Jonathan Gottschall, I might actually have been right about all of that – or at least some of it (he has nothing to say about the economy being a fiction). Just released this month, The Storytelling Animal: How stories make us human, is some inspiration reading for any writer (or fiction-creator in any media) who is asking the question why. Because as Gottschall will tell you, storytelling is one of our most fundamental and profound acts, and strikingly, it’s what makes us uniquely human. Now, Gottschall isn’t making a deep or especially scientific case for any of this. He is an English professor, and it shows in his lack of hard science referencing, and in his abundant use of literary references. But what he does give us are examples from a variety of sources and studies that show the prevalence and power of fiction in the human experience. Conspiracy theories, religious stories, myths, the fantasy play of children, dreams, film and the modern-day novel are all examined as shapers of social mores and conscience, as a way of working out deep-seated anxiety, and as a way of ensuring social cohesion. Along the way, Gottschall throws in some interesting factoids about the increased empathy of fiction-readers, the actual correlation between creativity and mental illness (actually much higher than you might want to believe), and the prevalance of conspiracy-theory believers in society. All fascinating – but what I appreciated most about the book is Gottschall’s use of story in what is otherwise a non-fiction work. Besides just giving description about his own inspirations and family observations, he plays a couple of tricks with brief fiction exerpts which are meant to reveal the power and depth of stories to you (and me), the reader. 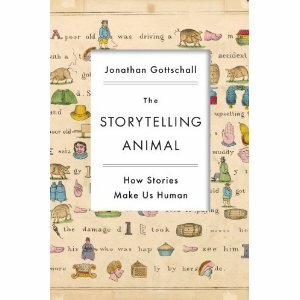 Gottschall winds up making the case that across culture, time and technology, the fundamentals of fiction stay the same – that as much as we evolve socially, we are still bound within the same anxieties and fears which are the primary driver of story – and to that end, we are in no danger of losing storytelling from our society. To the contrary, the increasing access to on-demand fiction may propose the opposite – that we risk becoming a society increasingly lost in the fictions we create. An engaging read, Gottschall joins scientific research and the humanities together in an easy style – so thumbs up. And if anyone wants to borrow my copy, you are certainly welcome to. ← So many things add up…..